The Frosty & Frostbite Aquathlon, hosted by our friends in Littlehampton, Tuff Fitty Club is a great opener for the race season. The inaugural race notoriously brings cold conditions and biting winds, but fortunately the sun shone down on the Blue & Gold as they raced in the 20th Frosty this morning. 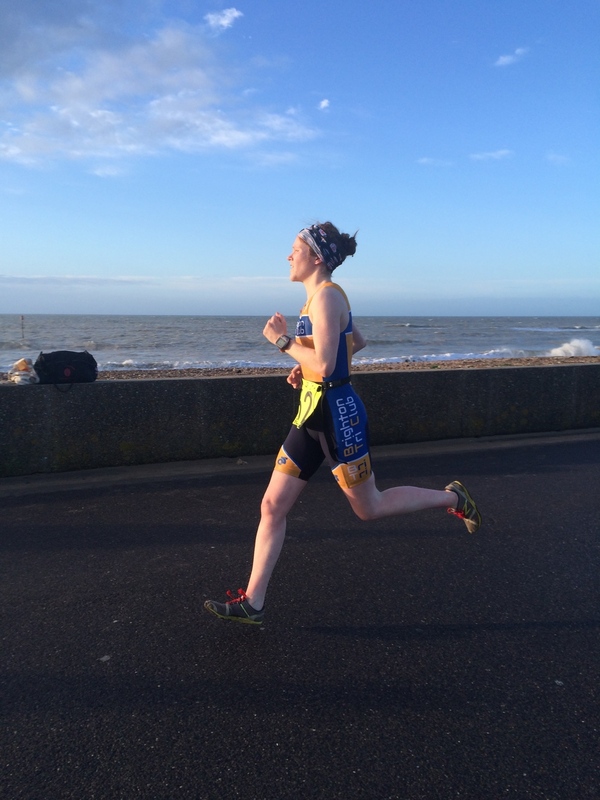 Amongst the finest Sussex talent were 4 Brighton Tri Club athletes. Phoebe Lebrecht representing Brighton Tri in the Frostbite (400m Pool Swim / 5k Run) & Graham Smith, Rose Wilmott & Shaun Challis representing in the Frosty (800m / 10k Run). Both races started in the warmth of the leisure centre, before heading out for a lap of the boating lake followed by an out and back of the windy seafront (twice for Frosty). The conditions were tough and so was the competition, but everyone's effort was commendable. Performances listed as; Phoebe Lebrecht (Frostbite: 11th, 3rd lady 31:24), Shaun Challis (2nd 51:42), Graham Smith (29, 1:02:34) and Rose Wilmott (40, 1:13:08). A fantastic start to the 2015 Season, now all eyes will be on the Club Champs! Congratulations to everyone who raced, it was fantastic to see so many friendly faces from neighbouring clubs. For more news, reviews & views on the Frosty Aquathlon 2015 check out the race report on Tri247 as well as the Club Forum Post.